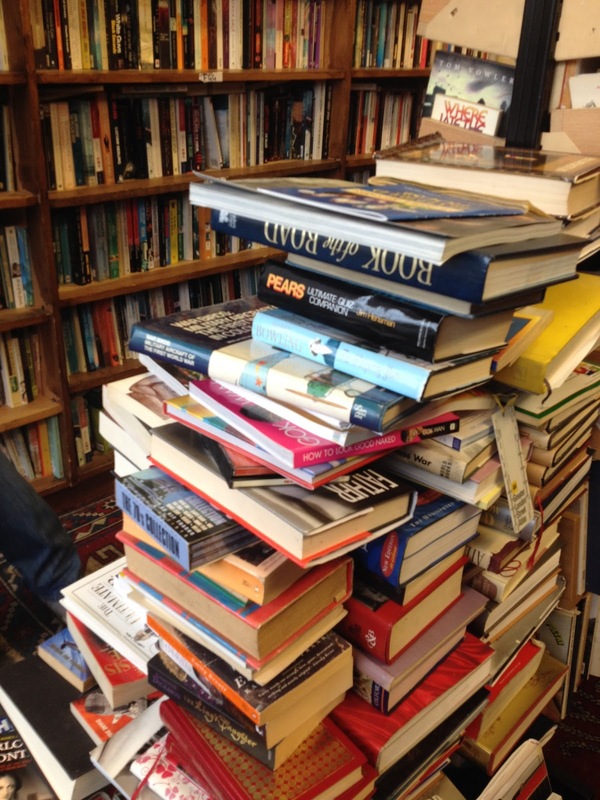 For some time, my friend Danny and I have been on the hunt for the nearest bookshop to where he lives. As he's London-based, you'd think that hunt would be short, but aside from the offer of a trip to one shelf in his local Tesco (I won't tell you my response but it's a wonder we're still friends) we've both failed to find a walkable bookshop to his home. Well, I failed. Danny found a compromise. Instead of going to the nearest bookshop to where he lives, we went for a trip to a bookshop he thought I'd enjoy exploring. He was right. 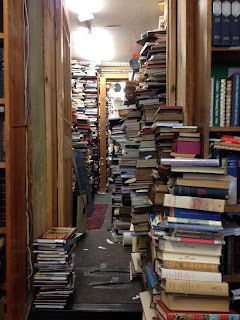 Halcyon Books in Greenwich must surely be every secondhand book lover's dream. 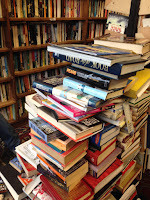 The books are piled high, it's just the right level of scruffy and, as the window proudly advertises, everything is permanently £1 (except children's books, they're 50p). I could pretty much leave it at that and I'm sure many of you would be getting your coats on and heading for the Overground train – the bookshop's across the road on the right as you walk to town from the station – but more still needs to be said. We arrived before lunch on a drizzly autumn day, but no one minded that we dripped a little on entry, instead leaving us to enjoy the warmth and the faint hint of that welcoming secondhand bookshop smell. Fiction awaits to the left of the door, with books arranged in roughly alphabetical order: ie, A, B, C by first letter but not by second or third. It's a plan I'd expect to be annoyed by, but the snug scale of the shelves means a little hopping around the alphabet doesn't really make much difference. Tallish shelves, placed close together and supplemented by piles of books wherever there's room means browsing is cosy. Lots of polite shuffling goes on as customers navigate the space available (by the time we left the shop was full) but no one minded that we were happily chatting away, catching up on news, exulting over random book finds and recommending titles we knew and loved. The cheap price tag made it incredibly hard to buy just one thing, especially when we left fiction and discovered DVDs (£1per disc) and a large stash of vinyl on the way to the non-fiction side of the bookshop. In the end we spent a minuscule amount on five items: Danny bought Carol Shield's The Stone Diaries (on my recommendation, even though I've not read it yet*), Beryl Bainbridge's Harriet Said... and a trains DVD called Along these lines. He said the DVD was a present for someone, but I'm not judging. As for me, it's rare I find any of my favourite writer's less popular novels so I snapped up The Reef by Edith Wharton, along with one of my favourite films, Never Been Kissed**. I wouldn't normally link to Facebook, but it's worth a look to see the photo they posted from within the shop a week or so ago. I find myself wondering if there's a bookseller trapped on the other side. *If you're reading this, Danny I hope you liked the book? **Okay, so it's hardly the most challenging of films to be watching, but it's the only time I've encountered a copy editor in cinematic fiction. The English version of that is my former occupation, sub-editor. Which happens to be the career I was in when I met Danny, although not at the place he now works, I wasn't *that* successful!